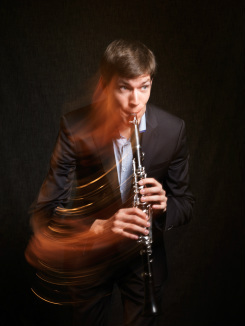 Acclaimed as a 'sensitive' and 'imaginative' performer, clarinettist Max Mausen excels as both a soloist and an orchestral player. He was appointed Principal Clarinet of the Malta Philharmonic Orchestra in September 2014. Alongside a regular recording schedule, Max's debut solo album 'New Waves' was released in December 2014. He was a member of Southbank Sinfonia 2016, and will join the Britten-Pears Orchestra for their 2017 performances. As a soloist and chamber musician he makes appearances in a multitude of genres including contemporary music and jazz. Max regularly collaborates with composers and has given world premieres in concert halls including the Wigmore Hall, LSO St Lukes and the Philharmonie Luxembourg. Born in Luxembourg, he started his musical training at the city's Conservatoire and later went on to study at the Guildhall School of Music and Drama in London. He has performed with orchestras and ensembles including the Philharmonia Orchestra, Royal Scottish National Orchestra, Malta Philharmonic Orchestra, Orchestre Philharmonique de Luxembourg, Orchestre de Chambre de Luxembourg, and the United Instruments of Lucilin. On the right hand side, you can find a list of core repertoire, which Max is happy to perform. This list is not exclusive and subject to change.